HIC's Oyster Forks are versatile additions to flatware as seafood forks, appetizer forks and cocktail forks. The 3 prong fork picks up food easily. The extra-wide left tine offers added leverage to help separate the oyster from its shell with little effort. Used in both formal and everyday dining, these small forks are perfect for enjoying oysters and other types of seafood on the half-shell, from clams to mussels, and work just as well for serving appetizers, finger foods, and small bites, like tapas and canapés. These stainless steel forks are up for the task at every dining occasion, from lunch or brunch, holiday meals, party buffets, even outdoor entertaining. Their bright finish and attractive look conveys a refined sense of purpose on the table. A tradition since 1965, HIC Flatware Sets are made in Japan from stainless steel and are dishwasher safe for easy cleanup. Set of 4 Oyster Forks. 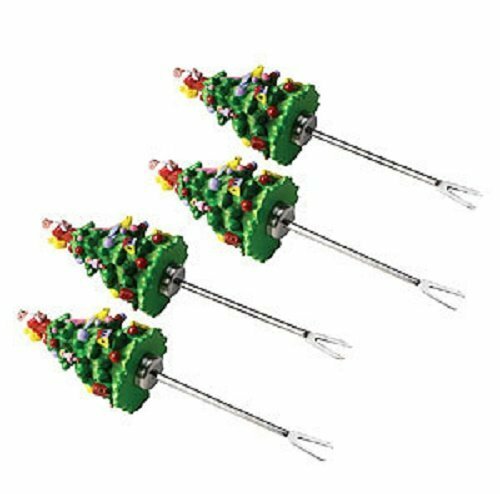 The set of four Canape Forks created with a Christmas Tree shaped resin handle and a stainless steel blade features the classic Spode Christmas Tree adorned with gifts & topped with Santa..Add a touch of sophistication to canapés or appetizers!! !-Great Hostess Gift!! HIC's Escargot Forks are versatile additions to flatware for serving and enjoying escargot. These small forks are sized perfectly for extracting escargot from their tiny shell with little effort. Snails have been on the menu since nearly the beginning of time and rose quickly to an elite status with the Romans. Today, Escargot is traditionally cooked and served in a rich buttery garlic sauce and plated on an escargot dish or snail trays with recessed areas to cradle the snails and their delectable sauces. Snail tongs are often used to help steady the escargot shells while digging out the meat. HIC's 2 prong Escargot Forks with pointed tips are up for the task at every dining occasion, and double nicely as seafood forks for other types of seafood, like clams and mussels. 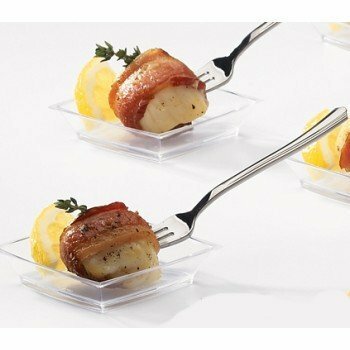 From lunch or brunch, and holiday meals, these stainless steel forks work equally well as appetizer forks or cocktail forks for serving horderves, finger foods, and small bites, like tapas and canapés. Their bright finish and attractive look conveys a refined sense of purpose on the table. A tradition since 1965, HIC Flatware Sets are made in Japan from stainless steel and are dishwasher safe for easy cleanup. 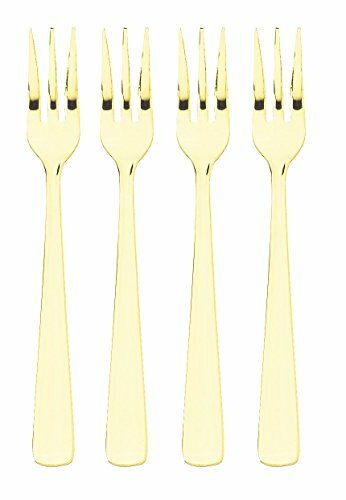 Set of 4 Escargot Forks. 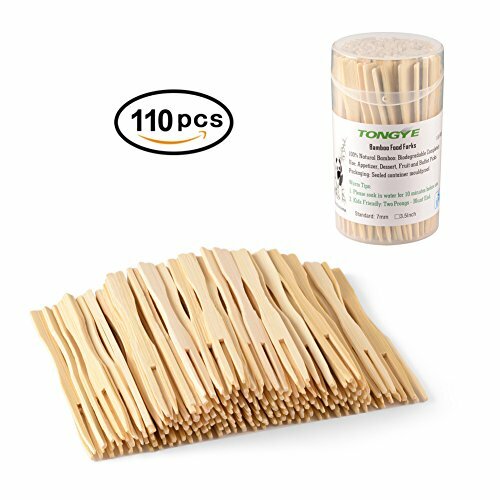 Rustic 210 Pack Disposable Wooden Cutlery Set 6.5"
HIC's Oyster Forks are versatile additions to flatware as seafood forks, appetizer forks and cocktail forks. The 3 prong fork picks up food easily. The extra-wide left tine offers added leverage to help separate the oyster from its shell with little effort. Used in both formal and everyday dining, these small forks are perfect for enjoying oysters and other types of seafood on the half-shell, from clams to mussels, and work just as well for serving appetizers, finger foods, and small bites, like tapas and canapes. These stainless steel forks are up for the task at every dining occasion, from lunch or brunch, holiday meals, party buffets, even outdoor entertaining. Their bright finish and attractive look conveys a refined sense of purpose on the table. A tradition since 1965, HIC Flatware Sets are made in Japan from stainless steel and are dishwasher safe for easy cleanup. 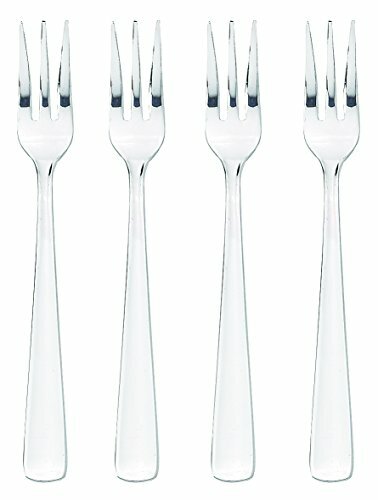 Set of 4 Oyster Forks. 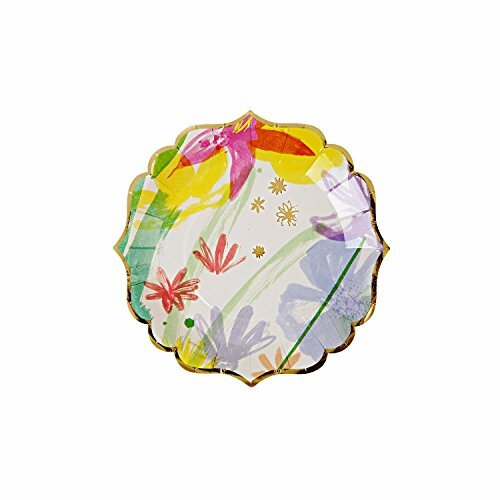 Meri Meri Painted Flowers Plates, Set of 8A beautifully styled paper canape party plate with a richly colored, hand-drawn pattern, finished with a shiny gold foil edge. 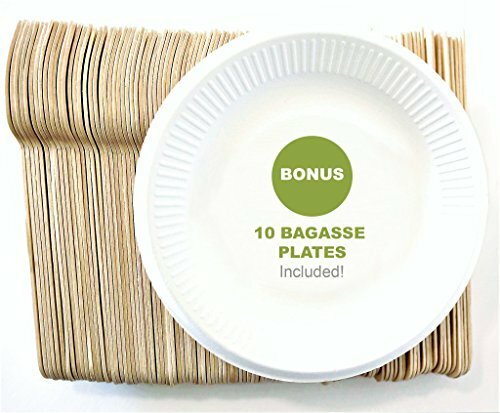 Pack contains 8 party plates. Plate size: 4 x 4 inches. Pack size: 1 x 4 x 4 inches. 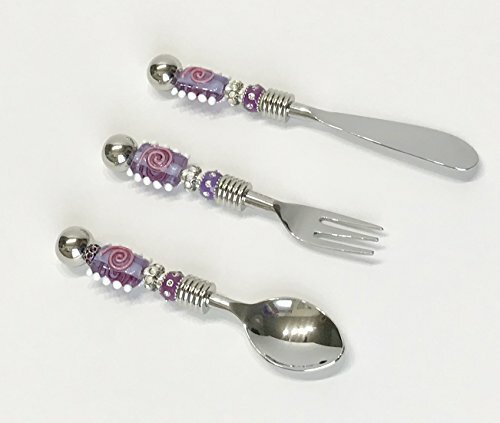 Ultra Violet canape utensil set including: Glass beaded fork, spreading knife and spoon. Ultra Violet is Pantone's® 2018 color of the year. This stunning OOAK canape set includes glass beads in violet, pink and white with rhinestone studded pewter spacers. The large glass bead is translucent violet with white hobnails on either side and a pink raised swirl front and back. Each piece also has a purple glass bead studded with rhinestones and 2 silver toned spacers. A third spacer is also rhinestone studded. This is a beautiful set that would make a lovely addition to your barware collection. Dimensions: Glass beaded canape knife - 5 1/2" Glass beaded canape spoon - 4 3/4" Glass beaded canape fork - 4 3/4" © 2018 Stella Erwin's®, LLC. All Rights Reserved. 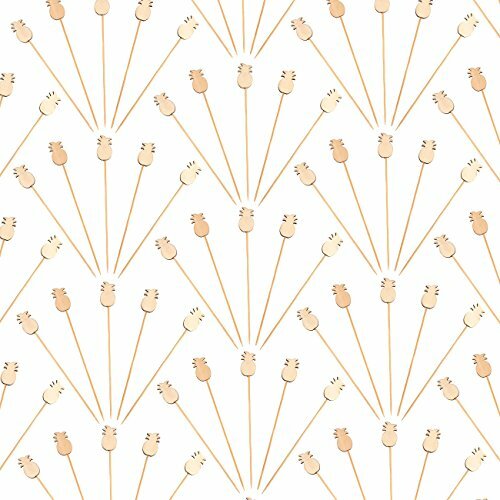 Copyright © Wholesalion.com 2019 - The Best Prices On Canape Fork Online.